Seeing as Taco Bell officially serves ridiculous stunt foods like fried chicken-stuffed quesadillas, a breakfast taco with a fried egg shell, and crispy egg roll-like burritos, it's easy to order insane combinations of meat, sauce, cheese, and other toppings without having to "hack" the menu. But if, say, the standard half-pound beef gondola isn't crazy enough for you, then it looks like the fast-food chain's got you covered with an extra-spicy new menu hack. 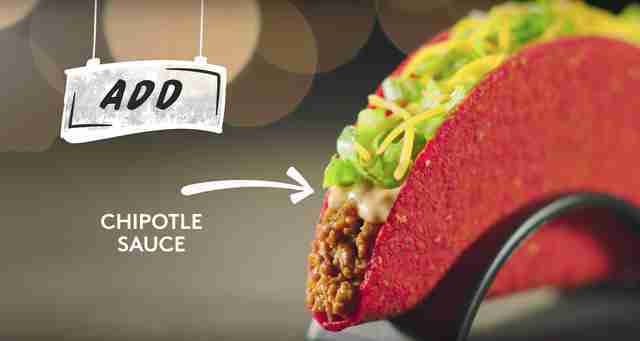 T-Bell dubbed it the El Fuego Taco and released a new video this week, revealing exactly how you can order one at any of its locations across the country. As you can see in the tutorial (shown above), the custom order takes a Fiery Doritos Locos Taco and cranks up the heat well beyond your usual Fire Sauce. All you have to do is order the alarmingly red taco like you normally would, but also ask for chipotle sauce and jalapeños on top. The result is a fiery taco that's apparently too spicy to be on the regular menu. Oh, and you can further fan the flames in your mouth by adding some Diablo Sauce, too. The video also reveals how you can make another spicy Taco Bell menu hack, Spicy Buffalo Chicken Nachos, with some quick modifications at home. Specifically, you'll have to order a Nachos BellGrande off the regular menu, substitute beef for chicken, and ask for jalapeños and onions as add-ons. Then, you add blue cheese crumbles and Buffalo sauce on top when you get home. Of course, this particular hack requires some assembly and the willpower to hold off on eating the nachos in the car, so... good luck with that. Tony Merevick is Senior News Editor at Thrillist and is inspired to go wild with menu hacks now. Send news tips to news@thrillist.com and follow him on Twitter @tonymerevick.